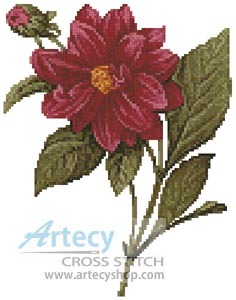 Reviews: Mini Dahlia Double Cross Stitch Pattern to print online. I really enjoyed stitching this. The pattern could not have been clearer or easier to use. Tereena provides excellent customer service as well. When I mentioned the trouble I had using the pattern on my tablet with a PDF viewer, she figured out the issue and sent me an updated file for free the same day! The mock up photo was helpful, but the finished piece does have a bit more detail and looks nicer, so I'm really pleased.